A hilarious story of a family dog who enters the corporate world to discover the struggles of being over-worked, pressed for deadlines, under-vacationed, and missing out on quality human time. Adults will appreciate the attention to detail in the illustrations while kids will enjoy the story of the talented Raymond, the dog who's trying to have it all and learns what really matters most along the way. Sit. Fetch. Have a cappuccino. When Raymond the dog starts acting human, will he miss the dog’s life? Raymond the dog is just your regular family pet until, one day, he has a thought: couldn’t he just . . . sit at the table? Isn’t that what families do together? Soon Raymond begins to leave all his canine ways behind, and so do all the other dogs in town. Dogs go to the movies; dogs go out for coffee; and Raymond lands a high-powered journalism job at DOGUE magazine. But is Raymond’s new gig all work and no play? He doesn’t even have time for family dinner! Maybe, just maybe, Raymond misses the dog’s life. . . . At once comedic and genuine, this tale about appreciating the simpler things in life reminds us all that work can wait — after all, there are more important things (like getting your ears scratched in just the right place). Yann Le Bec is a French illustrator and graduate of the Royal College of Art in London. 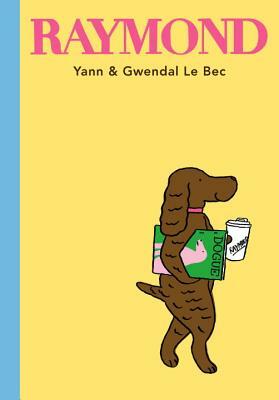 He and Gwendal are brothers and run the online visual blog News of the Times with fellow French illustrator Jean Jullien. Yann Le Bec lives in London. Gwendal Le Bec is a French illustrator who frequently works with the New Yorker and the New York Times. He lives in New York City. The Le Becs’ chic digital illustrations are just right for the busy, glamor-tinged life Raymond embarks on...It’s an entertaining “be careful what you wish for” story. A dog explores a career in journalism, then decides there are better things (for a dog) to do...What makes it all worthwhile? Getting "your ears scratched in just the right place." Le Bec’s digital cartoons show bleary-eyed Raymond hunched over his laptop, surrounded by a stack of paperwork and an extra-large takeout coffee cup. It takes a bouncy red ball to remind the workaholic hound of the simple pleasures in life.